Lyceum Lodge of Research meet four times a year, three regular meetings and the Installation meeting on the third Wednesday of November. "Introduction To Masonry or So you Want to be a Mason?" Please see our Calendar page for more information. Lyceum Lodge of Research is dedicated to research into Free Masonry and the education of Free Masons and other interested parties. Please see our Calendar page for dates. 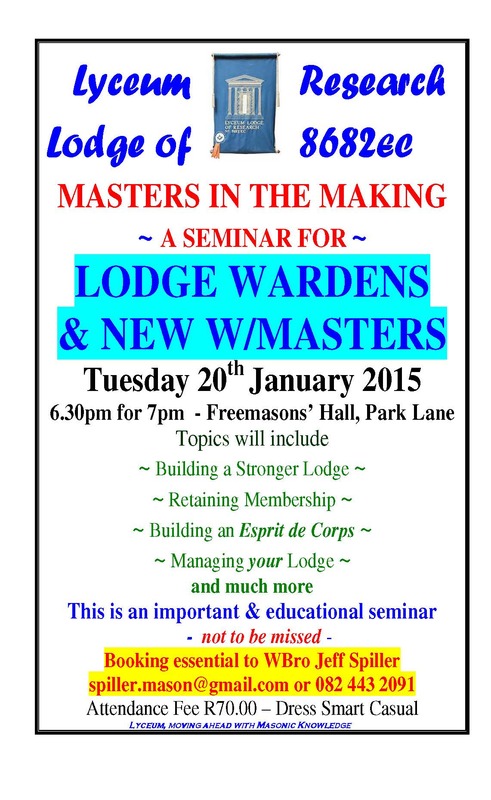 This seminar is aimed at those who want to become Freemasons. The decission to become a Freemason should not be taken lightly, Freemasonry is not suited to everyone and many approach Freemasonry with the wrong expectations. This seminar is both an opportunity for prospective Freemasons to learn about the Craft and a chance for active Masons to meet with prospective members. These prospective Masons could form the future of Freemasonry. Becoming a Freemason can be quite overwhelming, there is a lot of information to process and confusion can set in. This seminar is designed to answer the questions that most new made Masons have and to give them direction so they can get the most out of their membership of the Craft. Part of the Masonic journey is becoming the Master of a Lodge, which can be likened to being the President or Chairman of an organisation. Becoming the Master of a Lodge can be quite a daunting prospect and the success of the Lodge is largely determined by the success of the Master. This seminar aims at guiding those who will become the Master of their Lodge in the near future and even those who have recently become the Master of their Lodge. Tuesday 20 January 2015 - A seminar on "Masters in the Making"
Please go to our Booking page to make a booking for the next seminar.